A Wrinkle in Time celebrates its 50th year in print this year. 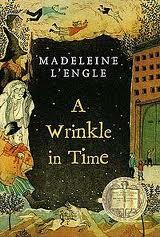 A Wrinkle in Time was published in 1962 and won the Newberry Medal in 1963. A Wrinkle in Time was my first introduction to science fiction. I was probably in the 3rd grade when our class listened to WiT being read. It made such an impression on me that when I ran across it in high school, I had to read it again; then I gave it to my sister to read. I’m sure I didn’t understand too much about the math & science involved, but the characters of Meg Murray and her brother, Charles Wallace, are characters that have stayed with me. Reading it again made me realize that the book is full of interesting characters & reminded me of what I loved about the book. From the grand entrance of Mrs. Whatsit to Mrs. Murray–a mother who knows how to encourage & love her children–the characters all have personalities anyone can relate to and just appreciate. 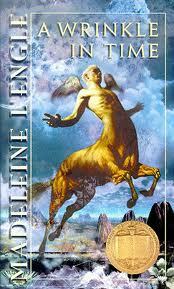 A Wrinkle in Time begins with the famous, or infamous, first line: “It was a dark & stormy night.” Really. This line is originally from the novel Paul Clifford by Edward George Bulwer-Lytton, first published in 1830. It has been considered the worst first line in literature & is frequently parodied, most famously by Snoopy of the comic strip, “Peanuts” by Charles Schulz. There is even a contest to write a bad opening paragraph for the worst novels ever written, held every year by the English Department of San Jose State University. The contest is called the Bulwer-Lytton Fiction Contest. Meg is a frustrated young girl who feels out of place at school believing she isn’t as smart and ‘normal’ as others. Her brother, Charles Wallace, is a precocious 5-yr old; though others find him odd, believing he doesn’t even know how to talk. Their worst problem, however, is that their scientist father has been missing for quite some time, and the rest of the town believes he has abandoned his family. Meg, Charles Wallace, and their new friend, Calvin meet three very different ladies: Mrs. Whatsit, Mrs. Who, and Mrs. Which. These ladies take the children on a journey to find Mr. Murray. This journey will take them to another world where they will have to fight an evil by learning more about themselves and their strengths. This was one of my favorite books growing up. Justin starts it soon, so I just got to read it again! 🙂 I never knew that about the first line. L’Engle makes it look deceptively easy, to write a classic sci-fi fantasy adventure with great characters and theological themes. A Wrinkle in Time is one of those books where everything just comes together really well. She’s economical with her words and characters, but generally uses just the right ones for the situation. I also agree with her statement that science fiction is uniquely suited for explorations of God’s creation and glory; it’s too bad that so many science fiction writers are in denial and believe that science and the supernatural are directly opposed.